The DCU team that took part in the recent Dublin Inter-Collegiate Cup. 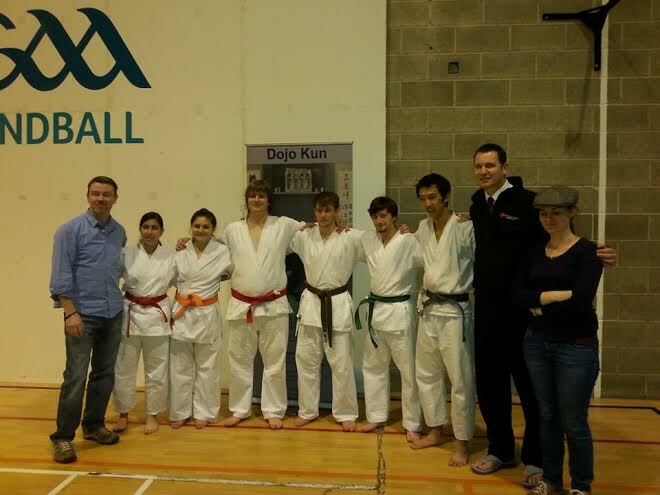 DCU Karate Club won 11 medals, including two gold medals, in an impressive performance at the second annual Dublin Inter-Collegiate Cup 2013. Six competitors from DCU took part in the AIB-sponsored contest in UCD Sports Complex. Students from UCD, DCU, Trinity College, RSCI, Griffith College and Dublin Institute of Technology also took part in the contest. The competition was divided into Kumite or sparring and Kata, which is a set of movements. Avril Jatariu won two gold medals for placing first in both Kumite and Kata. Martin Kenny came second in Kata and Kumite. Austin Fanning reached joint third in Kumite. Hannah Bechara placed third in Kata and Kumite. Bechara, Jatariu and Fanning joined up for team Kata and finished in third place. In the brown to black belt division Kumite, Rick Ozawa also notched up a third place finish. DCU Karate Club 4th Dan Instructors Neville Reilly and Fran Meggs, who are also JKA qualified referees, assisted UCD with the event. Sensei Reilly gave his reaction to the performance of DCU’s competitors: “Our DCU KC team put in a great display and took home 11 medals in both Kata and Kumite, which makes all of the DCU instruction team very proud. The competition followed JKA rules and was in the style of Shotokan Karate. TCD won the overall competition and received a trophy courtesy of sponsors AIB.